Video to Audio Converter for Mac - Mac Video to Audio Converter software, convert MP4 to MP3. Mac Video to Audio Converter, convert MP4 to MP3 on Mac. 3herosoft Video to Audio Converter for Mac is very professional Video to Audio Converter software for Mac users that can extract audio track from any popular video formats. It can easily get MP3, WAV, AC3, WMA, M4A, OGG, AAC, RA, or AU audio from video MPEG-1, MPEG-2, MPEG-4, WMV, AVI, MP4, 3GPP, 3G2, MOV, RM, RMVB, OGG, DV, H.264/MPEG-4 AVC, MKV, FLV, etc. The converted audio files can be played well on iPad, iPad 2, the new iPad, iPad 4, iPad mini, iPhone 3, iPhone 4, iPhone 5, iPhone 5S/5C, iPhone 6/6 Plus, iPod shuffle, iPod nano, iPod classic, iPod touch, iPod touch 4, iPhone, Zune and regular MP3 Players and so on. 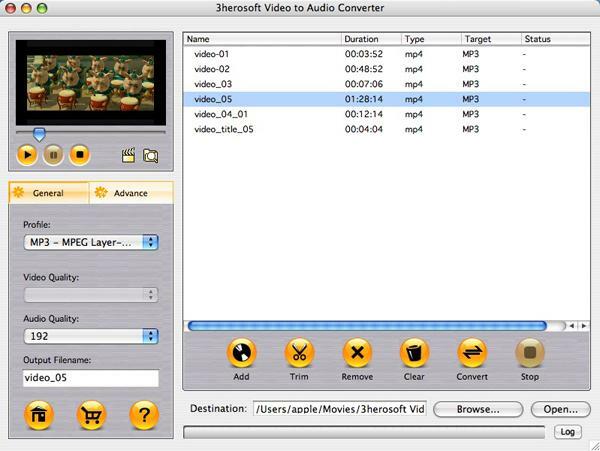 This 3herosoft Video to Audio Converter for Mac can also support batch conversion, so you can start multi-conversion at the same time and set many output audio formats for video to convert. Besides, it has various functions for you to edit the videos like customizing file size, ripping DVD's any segment, selecting target subtitle and audio track, setting video and audio Bit Rate, Frame Rate, adjusting Resolution and so forth. Extract audios from various videos like MPEG-1, MPEG-2, MPEG-4, WMV, AVI, MP4, 3GPP, 3G2, MOV, RM, RMVB, DV, H.264/MPEG-4 AVC, MKV, FLV. Convert among popular audio formats, MP3 to WAV, M4A to MP3, WMA to MP3, MP3 to AAC, MP3 to WAV. Convert various videos to audios like RM to MP3, MP4 to MP3, WAV, M4A, AAC, AC3, OGG, RA, and SUN AU. Extract and convert any clips from videos or audios by specifying the desired start time and duration. Adjust parameters like Bit Rate, Sample Rate, Channel, Encode mode to customize output of your own with high quality. As RM to MP3, MP4 to MP3 Converter, you can edit the output MP3 ID3 tag info including Author, Album, Genre, etc. in advanced profile settings panel. Simultaneously convert multiple video and audio files in batch process to save much time. Offer several interface skins and English and Chinese languages to meet your needs. How to convert MP4 to MP3 audio on Mac? How to extract MP3 from AVI files on Mac?